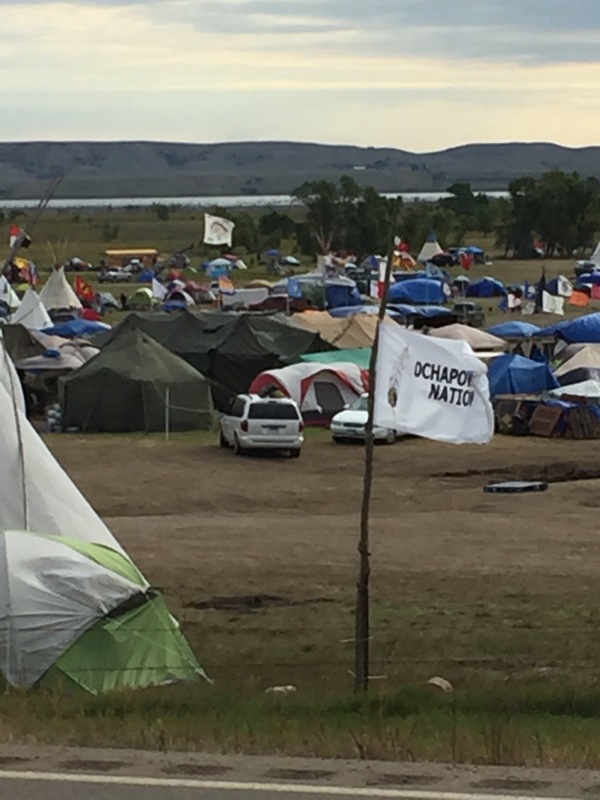 I just returned from Standing Rock, North Dakota. A young street artist noted, as I painted a bee on his community canvas, “This is just like a beehive!”. We marveled at the amazing gathering of people from around the world, all entering into an alternative world of the gift economy. Like the bees, everywhere you went, people were busy volunteering their time. The first thing we were invited to do was “jump in and help” where needed. So, I worked in the kitchen. I picked up trash. I served the elders. I helped at the Sacred Sweat Lodge fire preparation. The people assembled were of all races and creeds. It was love in action. The division of labor was like a beehive—from guarding the permeable entry to make sure no weapons or drugs came in, to cleaning, to feeding, teaching and caring for the children, to helping the sick, to nonviolent resistance at the front lines where the pipeline scars remained. No money was exchanged. It was like the peaceable kingdom. It was the Great Banquet where the least of the least, in spite of the politicians, the pundits, the journalists, the gawkers, the famous were welcomed with open hearts and arms. And there to welcome our Dismantling the Doctrine of Discovery group was our MCUSA symbol, attached to the flagpole of many nations. Where it came from, nobody knew. Entering into the main camp (of which there are 4 camps) with thousands of others, from all over the world, including politicians and dignitaries, there was almost a festive feeling of celebration. A feasting together on justice, love, respect and an open hearted shared community. This effort is rooted in prayer. 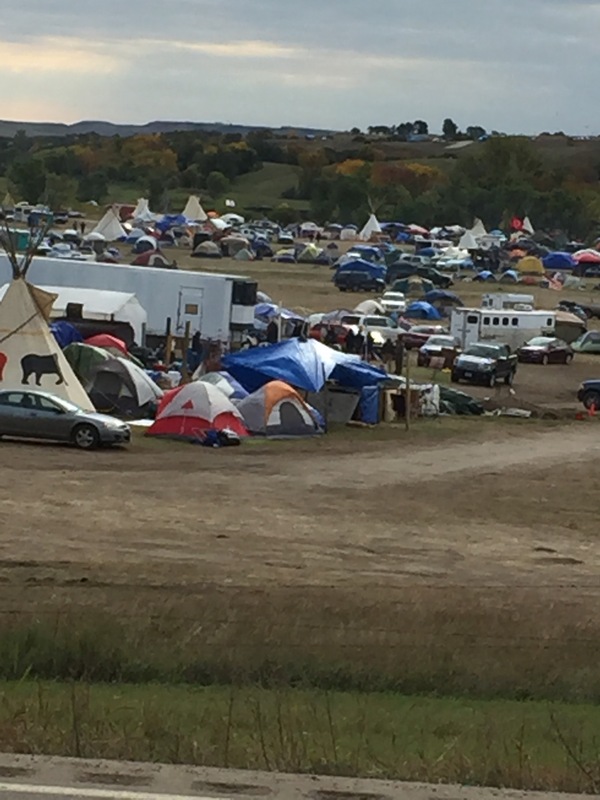 It was remarkable to see the intelligence of thousands of human beings organizing at this remote on demand site. Red Cross and Traditional Medicine camps, makeshift kitchens. Recycling. Trash pickup. Water for the masses. Spiffy Biff’s porta-potties, regularly serviced. Ceremonial and prayer spaces. Communal gathering places to vision and plan. And the material resources pouring in….wood, water, food, clothing, tents, sleeping bags, stuff galore. And the beehive busy sorting, organizing and storing. Horses, tents, tipis, Indigenous people from all nations—Canadian Ojibway, Shawnee, Menominee, Lummi, Potawatomi, Sisseton Wahpeton, White Mountain Apache, Mochican, Cheyenne, Lake Superior Chippewa, Crow Creek Sioux, Southern Ute, and the New Mexico Pueblos along the Rio Grande. All brought their flags and an amazing gathering of unity. From multiple conversations, I learned that Great Chiefs such as Sitting Bull had predicted that 7 generations hence from their lifetimes, after suffering upon suffering, the 7th generation would rise up to defend Mother Earth. This would be a rainbow of humanity coming together, not just Indigenous people. Thus, even we settlers, who represented a colonizing people, were welcomed in with generosity. As one Indigenous Elder said, “The is the way we are healing humanity”. One Maiti grandmother said, “We are all Indigenous. We are all guests. Mother Earth is the host”. The sooner we understand this perhaps the sooner we will all heal from the sorrows we visit on each other and our lifeline, this planet. So into this amazingly joyful community we were absorbed for four days. Sleeping on Mother Earth each day and living outside continuously would seem at first to be hard. But by the end, I felt stronger, healthier, more vital from the energies of the wind, the soil, the quiet, and unplugging from a culture that is becoming increasingly disconnected, sick and violent. There was good news and bad news at the frontline. Mostly young people were encamped, including one very young white woman, as slender as a reed with a brilliant heart and mind. She said that they were awaiting the court’s decision, hoping to delay things in court. Meanwhile, the Pipeline company, Enbridge and their billionaire Texas investors, had bought up all the land that we could see sweeping south to the Missouri—from a rancher who was paid millions. 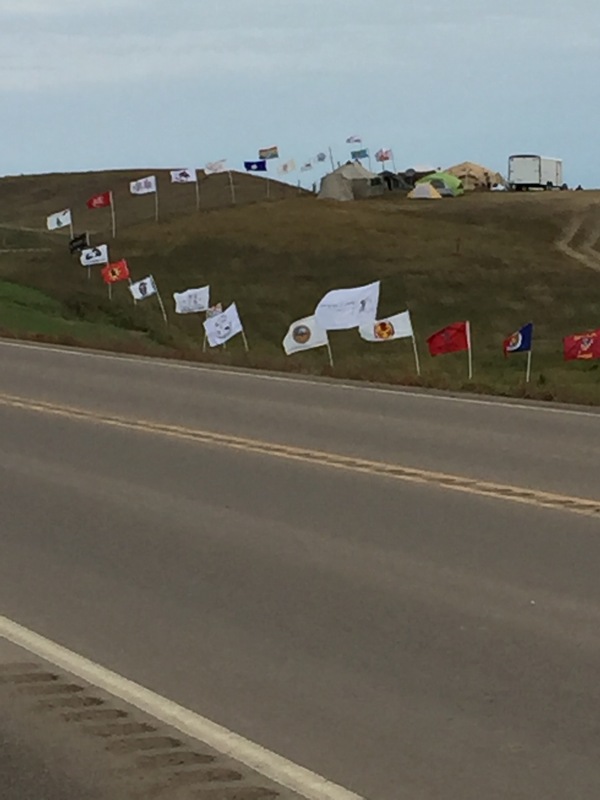 They planned to continue, avoiding the tiny piece of roadside that the water Protectors were encamped upon. To our North were the desecrated sacred grounds and the silent Caterpillars, for now. Keep your hearts open. 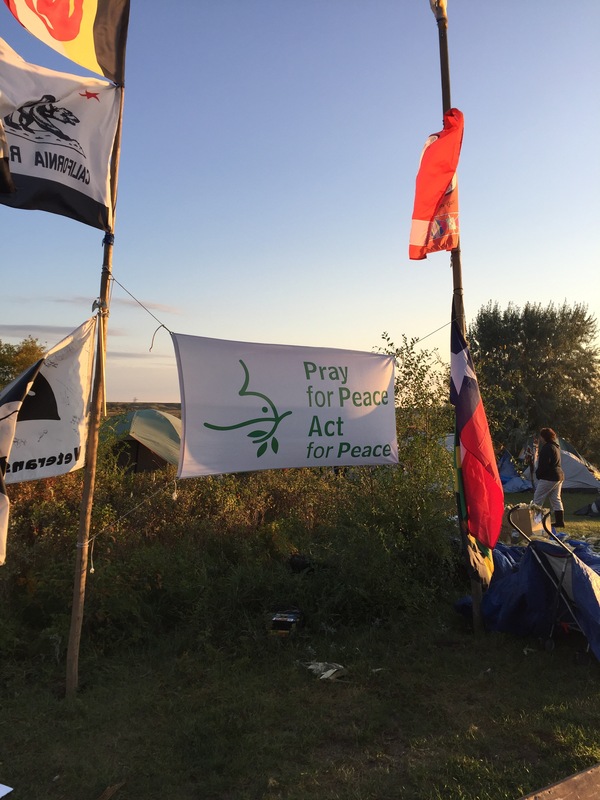 Continue to pray…and act for justice. Winter is coming and the people are not leaving. Something too precious is at stake….for all of us. Can’t wIt to hear more about this, Anita. Hope you are having a wonderful connection there in your childhood land! Safely returned from a good weekend. THANKYOU for your words and sharing your journey with us.